Hunters everywhere have become increasingly aware of the whitetail's extreme attraction to apples, but because apples are seasonal, they are only available in late summer and early autumn as an attractant source. 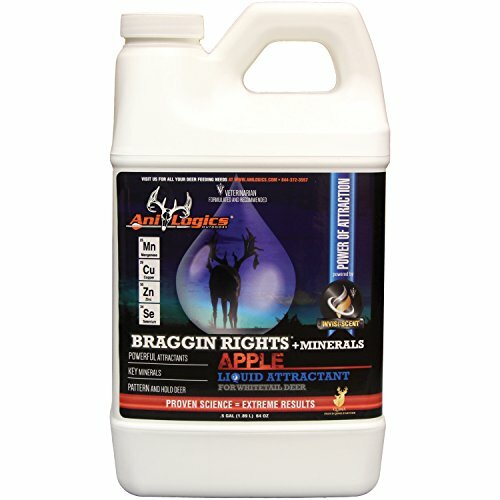 Braggin Rights® + Minerals Apple-Liquid Attractant brings the temptation of deliciously ripened apples to your whitetail herd any time of the year. Great for top dressing an existing mineral lick or for use with trail cameras. It is ready to use for less mess. Use it anywhere you want to attract and hold deer. INVISI-SCENTTM Technology is exclusive to Ani-Logics Outdoors®. These powerful attractants appeal to the whitetail's keen sense of smell. Did you know that deer have 297 million scent receptors in their noses? These receptors help deer detect, seek out, and locate this unique scent. All three Braggin Rights® Liquids have incredible attracting power to draw deer in and hold them on your hunting property. Can be used alone on a decayed tree stump or on top of a protein or ani-mineral block.